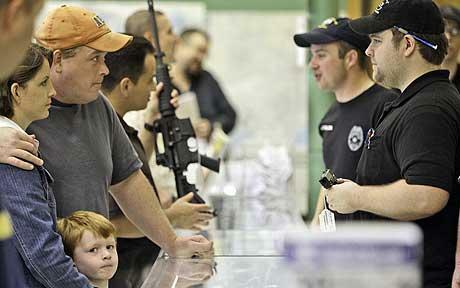 A pledge by US President Barack Obama to tighten gun control laws has led to firearms sales soaring across America. We first heard about this from friends in Texas, then Oklahoma…. You decide what it may mean…. One shop says the “hoarding” of ammunition since Obama’s election has created a shortage. Four months after the election of President Barack Obama, firearms and ammunition sales in Tulsa remain at a fever pitch. Popular self-protection ammunition is often sold out at local stores, weapons are flying off shelves and the state reports an 87 percent increase in concealed carry permit applications for February 2008 over February 2009. Gun sales spiked in November with the election of Barack Obama and Democrats adding to their majority in Congress. But local gun dealers say the spike is turning into a steady climb with political worries about gun rights as well as worries about the economy and potential for increased crime. Prall said his store planned ahead for the increase, having seen a similar spike after Bill…. You are currently browsing the archives for the ammo category.